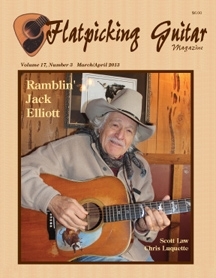 Welcome to the March/April 2013 issue of Flatpicking Guitar Magazine. This is Volume 17, Number 3 of the magazine and we are proud to feature Ramblin' Jack Elliott on the cover. Jack is a legend in American folk music and has a performing career that spans back to the early 1950s. Also featured in this issue is a great guitar player from the Pacific Northwest, Scott Law, and we also feature Chris Luquette, who for the past year has been touring the country with Frank Solivan and Dirty Kitchen. Plus all of our regular columnists are here to provide you with great tunes for your picking pleasure. We hope that you enjoy this issue of Flatpicking Guitar Magazine! Flatpick Profile: Chris Luquette & "Down in the Willow Garden"
CD Highlight: Scott Law & "Bells of Unity"